Remember the pattern I promised I'd find for the pink dot dress? Well, this isn't it. But it's close! And better yet, there are THREE of them listed on eBay right now. The one above is B41; click on the image to go to the auction. For B35, click here, and for B37, click here. You know, if you a see a pattern you like on eBay, it's usually a good idea to search on that pattern company name and number, just to make sure you haven't overlooked a nicer copy, or one in a better size, or just one by a seller you like better. And if you see one you like but it's NOT your size, you should save your search … then eBay will email you when a new one is listed. I hope this is not stating the obvious, but I went out to give a talk at eBay on Monday and it turned out that perhaps some of the things I think are obvious about eBay shopping are not … anyone else have any eBay tips? You know where the comments are! I really love both of those pictures. Just wondering if those gathers under the bust dart wouldn’t look a bit odd on a human person (especially if that human person were rather well-endowed)? Yes, they are both yummy. So yummy that the first one is now on its way to me. Bwahhahahahaha. You have been such a bad influence on me, Erin. My studio used to be full of quilting cottons. Now I have bales of knits and silks and apparel fabric and no time to sew. And yet? I cannot stop sending wads of money to Emma One Sock. Have you SEEN the fabrics she gets? Those ebay tips were good. I don’t shop a lot on there, so I don’t know all the ins and outs. And the B37 of the first one is on it’s way to ME. 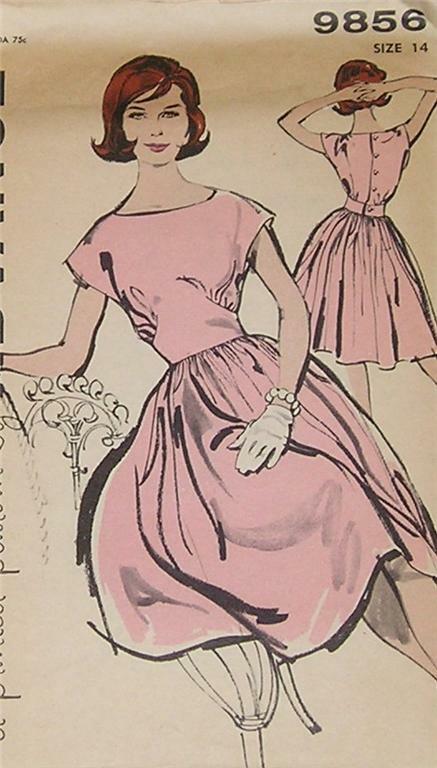 Pattern costs so little, but the shipping… Oh well, it’s my first vintage buy and it’s my birthday next monday! You girls are FAST! All gone!Lovely dresses. I have never purchased a vintage pattern, and that’s in part due to the fact that I don’t understand the sizing. What does B41 mean? Is it the bust measurement? Any clarification would be VERY much appreciated! Shoot! All gone. Well, I guess that’s all part of the fun of pattern hunting on eBay. B followed by a number is the bust in inches. For skirts and pants, W = waist and H = hips. Re eBay tips, I would say it is important to use an eBay snipe service, where your bid is automatically entered for you with a couple of seconds to go – especially when you are buying internationally. I’ve tried them all, and justsnipe.com is the best…Some of them also allow bid group sniping, where you can identify, say, three of the same item and have the service snipe the items one at a time at your pre-set maximum price as they end until you get one.It’s good to avoid the bidding war factor, especially when you’re looking for something unique or vintage. Those are good thoughts, Erin. They sound like they should be obvious but weren’t to me. Here’s my two cents on Ebaying. When buying fabric always check for some sort of scale regarding print size (a coin, a ruler, etc.) and always know the fiber content or kind of fabric. I went and ignored these rules (though I’d figured them out from my online browsing) when I made my first fabric purchase last week. The fabric was not cotton as I was sure it looked in the photo (duh! )and the print is so large (and just along one selvage. I thought the questions but didn’t ask them. So I don’t fault the seller at all. I believe it’s a chiffon. http://cgi.ebay.com/ws/eBayISAPI.dll?ViewItem&ssPageName=ADME:B:EOIBSAA:US:11&Item=270140975037 It’s very sheer and drapey. It’s not a true white background. In some light it’s a _very_ pale mauve in other light it is a very pale dove grey. Anyone have thoughts as to what I could make (even to make and sell)? Maybe you want to buy it? Thanks! schnifey@juno.com All that to say know your purchase!!! I’ve been buying on Ebay for 9 years and selling on and off for 4. I am truly addicted to it. And boy, has it changed in the last few years. There was a time when no one was really interested in “old clothes” and I have some real beauties in my closet, all bought for a song. A few tips for vintage clothing and pattern buyers:1. Ask questions well before the end; don’t be disappointed.2. Learn the sophisticated search functions of Ebay, using the wild card (*) and multiple search term functions. Some of my saved searches are really long, but they give me exactly what I want.3. Capitalize on others’ poor spelling skills. Really. I once bought a new DVF dress for $45. The title said Furstenburg instead of Furstenberg, and I found it by searching for furnstenb*. 4. Ignore marked sizes completely. Learn your garment measurements (including ease).5. Don’t browse on Ebay. It’s way too overwhelming. Use magazines or catalogs to decide what type of thing you want, then search for it specifically.Enjoy! This pattern picture is a knockout – the front picture is all innocence and white gloves; the back picture is a celebration of sensuality. I’m an ebay pattern seller and sell from my ebay store http://www.MoonwishesStore.com , so everything is a Buy It Now. we have about 7000 patterns listed currently (most on sale for 10% till the end of July). I have boxes of vintage patterns that I still need to list and even more boxes of more current patterns that I need to list. We have been doing this for awhile and have learned a few things.My comments to buying on ebay is don’t be afraid to ask questions or ask for additional scans of the pattern such as the back of the envelope or the technical drawing on the instructions. If it is important to you (it is to me) look for those words “UNCUT”. If your seller won’t answer your questions within a reasonable period of time (say 24 hours) pass on them and move on to a more resonsive seller. And since most of want to jump onto a project when first inspired to do it, is the seller known for fast shipping or are there significant feedback complaints about slow shipping. 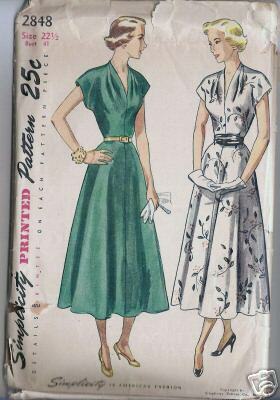 Also many vintage patterns came precut from the factory so you want to know that the pieces have been counted and are all there.I have a two great resources for dating patterns from the 40’s and 50’s written by a Wade Laboissonniere. These books are a great resource to the styles and pattern construction of the times. If you are seriously into vintage patterns these would be great books–lots of color pictures of pattern envelopes.Also many pattern sellers have a backlog of patterns to list, don’t be afraid to ask if they might have the pattern in a different size. And yes, pattern companies reused their numbers, so be sure you see a picture of the pattern to be sure what you are getting, otherwise you may get a pattern for men’s boxers instead of the evening gown you are expecting!Happy shopping and I trust Erin won’t mind my bit of promotion. The next time that you speak at eBay… could you ask them to stop interfering with the search? Please? I’ve noticed time and again that items that SHOULD have come up in my search have NOT. It happens so frequently that I can’t help but wonder what they’re up to? AND – they keep making store items harder to find! Ack! How can I SPEND MONEY if I can’t get to the things I want to buy??Ok.. I feel better.. thanks! anonymous: Store sellers keep asking those same questions! Ebay treats us like poor relations. Last year for about 6 weeks when stores where in search, store sellers were making money/buyers were happy. Then ebay decided buyers didn’t like having so many options and pulled the rug out from under us. They won’t listen to us, maybe Erin with her huge vocabulary can say the correct words that will make the bigwigs understand the problems. Erin: Ebay Dialogue Ambassador?